Happy Halloween, Friends! 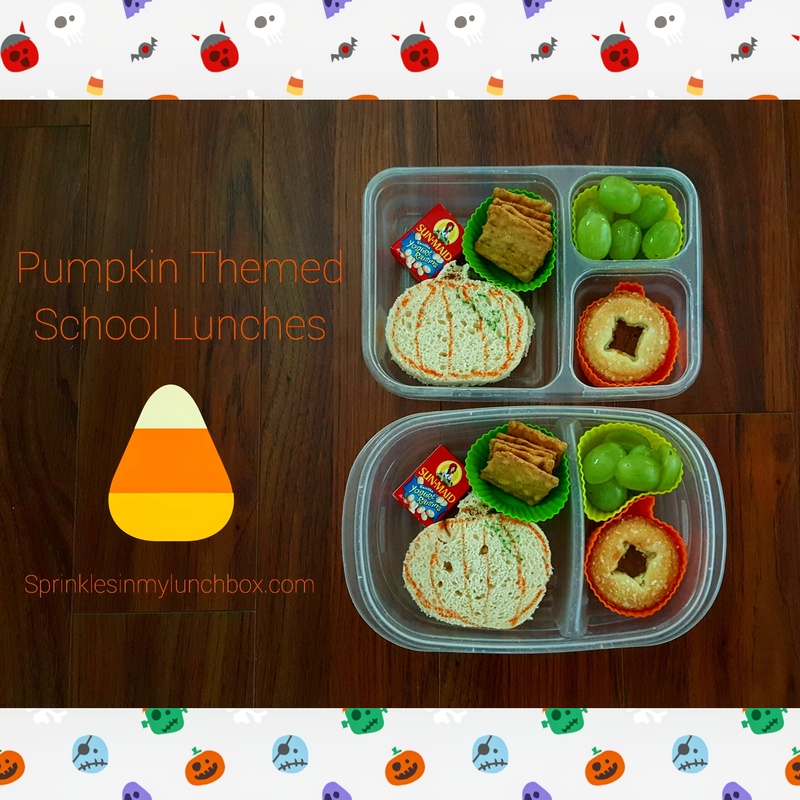 For today’s lunches, I made Jack O’ Lantern sandwiches. On the inside is cream cheese and Trader Joe’s Pumpkin Pie Spice Cookie Butter. I used my food safe markers to add some details. And just like real Jack O’Lanterns, each one is different! HA! That bottom one looks like one that’s been sitting out for a week already, but hey, I don’t think my Smalls will mind too much! I also packed raisins, red and green grapes (sliced in half for Smalls, because he still likes to shove them into his mouth all at the same time), some Trader Joe’s Inner Peas, some veggie straws since I ran out of Inner Peas, an apple, a Kit Kat, and some black and orange chocolate covered sunflower seeds. Whew! 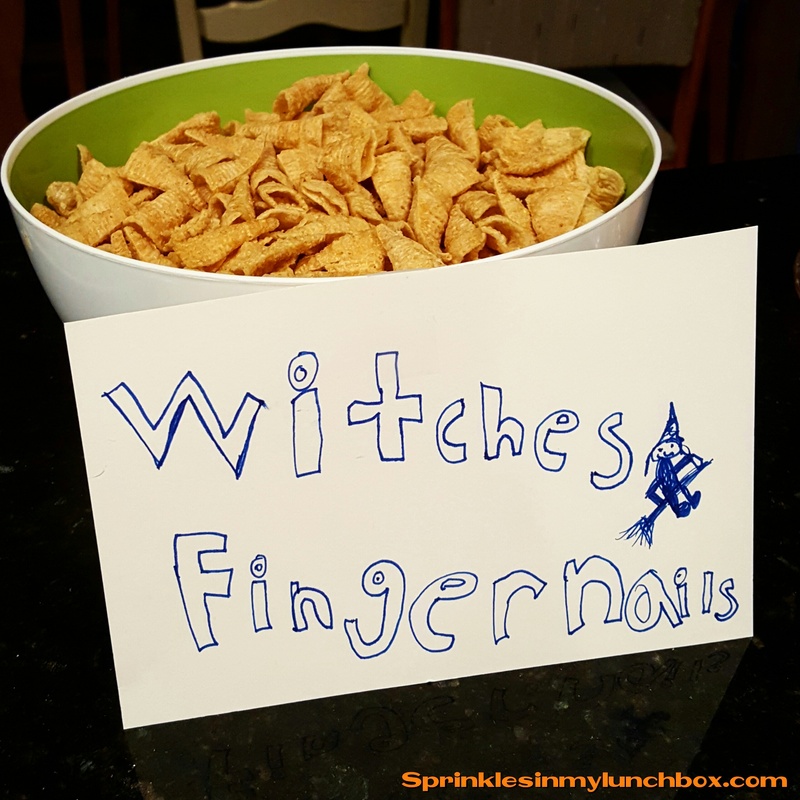 I hope today is a BOOtiful day for you, and that you don’t fly off the handle if you’re feeling witchy, and that you have fun trick or tweeting if you’re a bird, and that you enjoy your i-scream if you’re a ghoul. Okay. That’s a wrap on my puns now. You know, if you’re a mummy. 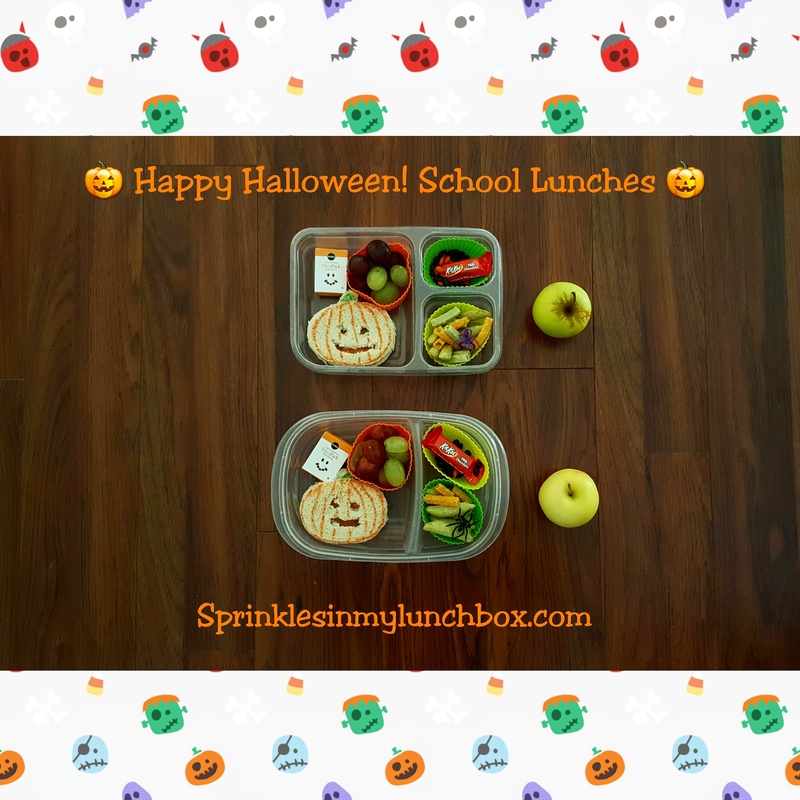 Halloween Party Kid Food – BONE Appetit! Are YOU having a Halloween party? 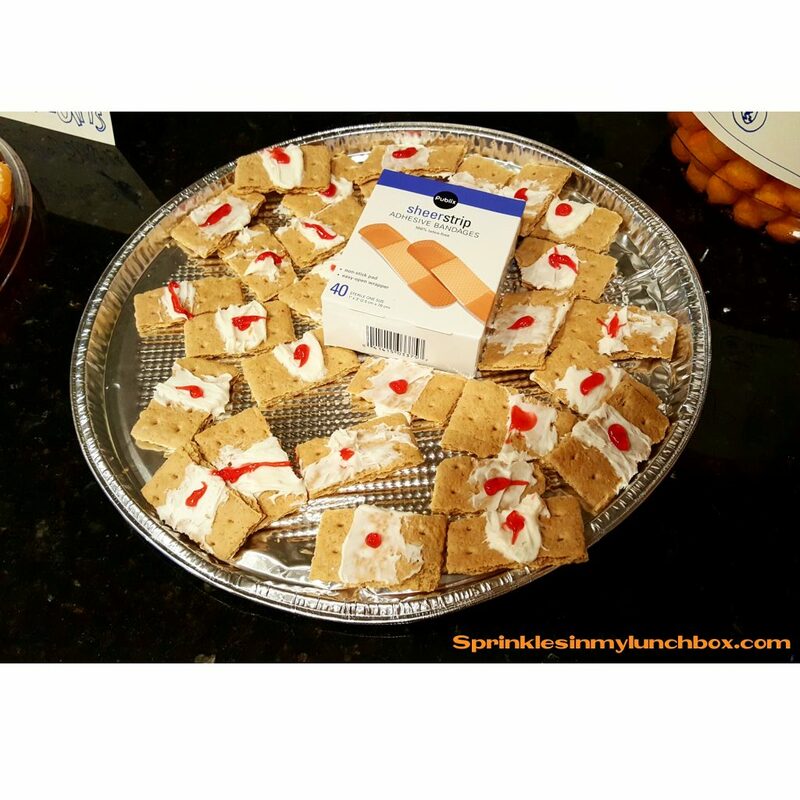 Do you still need some food ideas? Boo, do I have some for you! Read below…if you dare…..mwahahahaha! About a month ago, I received a call from a sweet friend of my boys (who also pretty much has me done in for, precious as she is!). She told me she was throwing a Halloween party and wanted me to be her “Chef”. How amazing is that!? She poured her heart into this party, planning every last detail – the decorations, the games, etc. She even had my husband, who is a DJ, provide the music. This was a party for the ages! So, as the Chef, I pulled together some menu ideas with her wonderful Mama, and our planner approved them ( 😛 ). Each of the other invitees offered to make the items on our list. And here they are, in all their Halloweeny glory! To make this, you simply carve a pie pumpkin to look as if it’s barfed/vommied/puked…the nastier, the better! 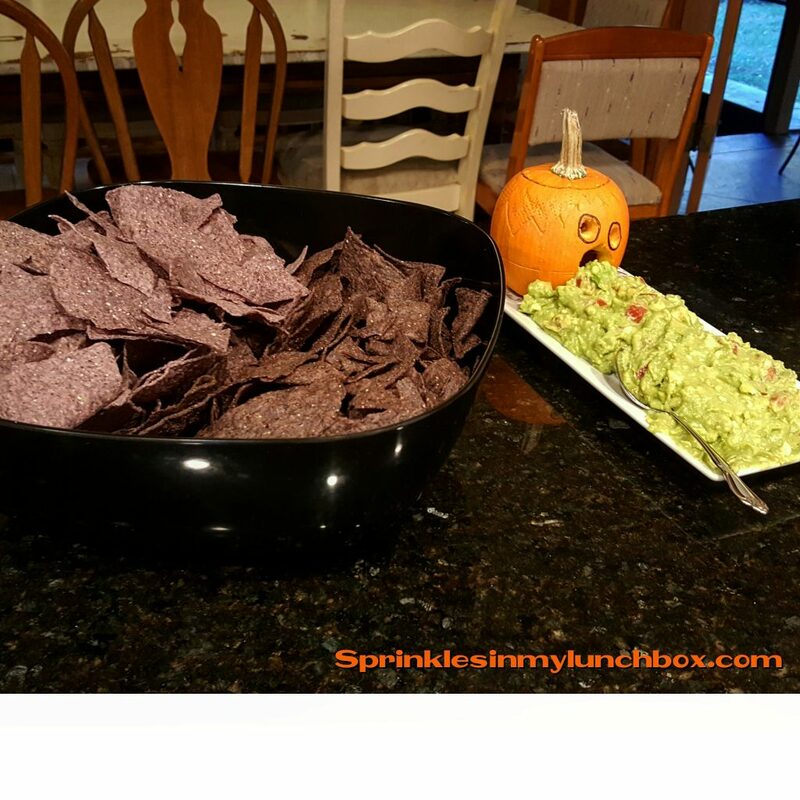 Put your dip (guacamole worked best for us because…guacamole) in front of it’s gaping barfy mouth. 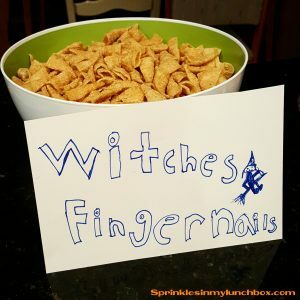 These are Bugles! And how cute is this sign? A lot of thought was put into that sign. 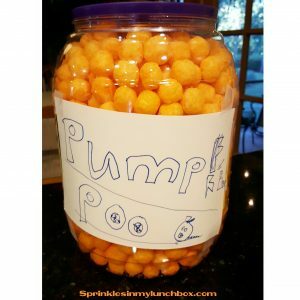 This “Pumpkin Poo” went over well with the kids! Also, how can you go wrong with cheese balls? Every party needs cheese balls. 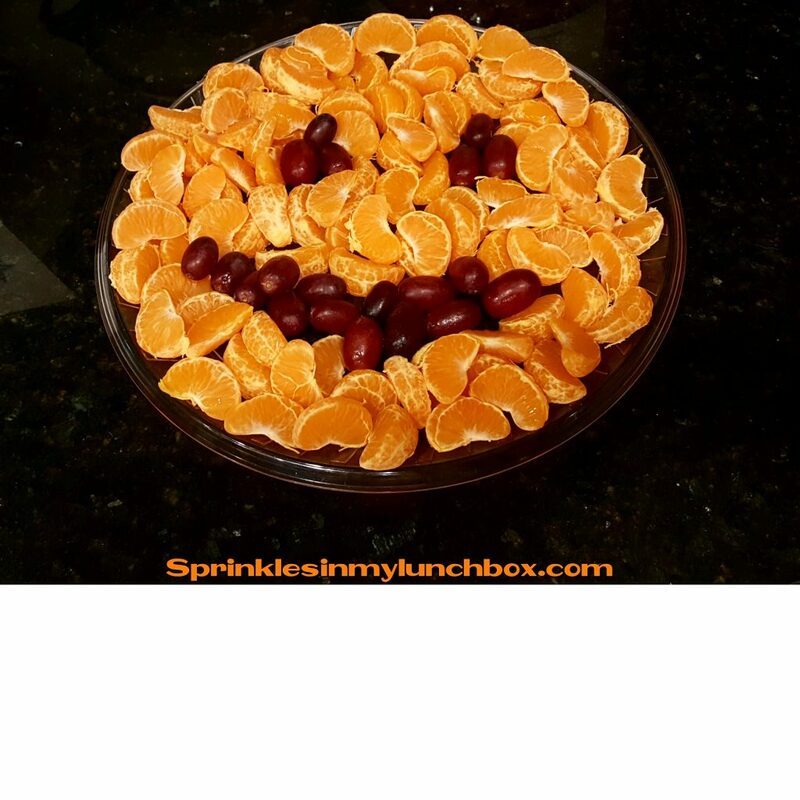 This sweet and fruity Jack O’Lantern was gobbled down in no time! It’s made with orange segments and grapes. You can use blueberries in place of the grapes or do a mixture of the two. 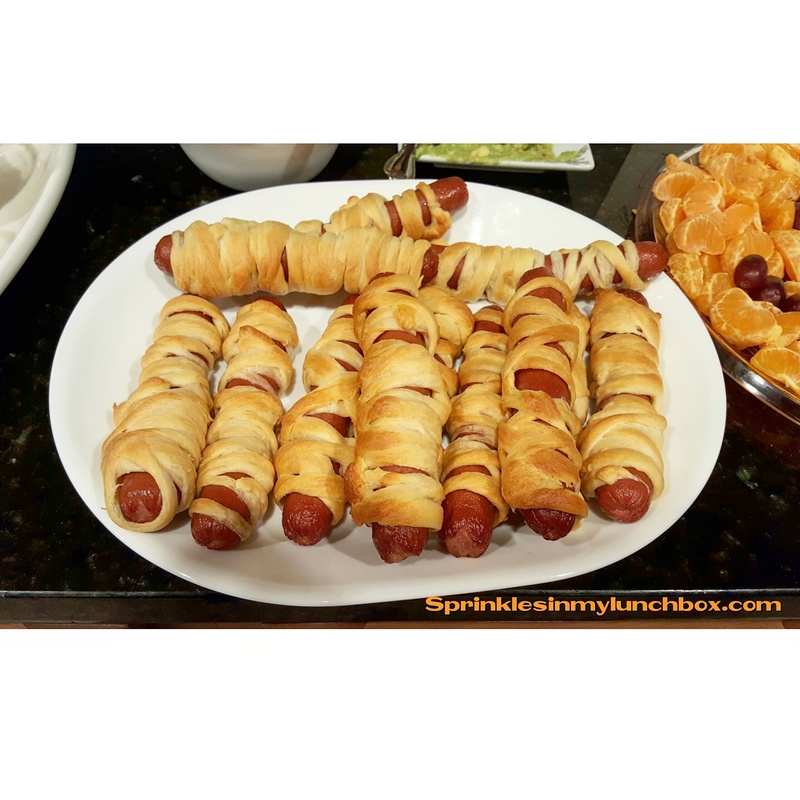 These Mummy Dogs are so easy to make, and leave quite a spooky impression! All you need is hot dogs and crescent rolls. Preheat the oven to 350F. Dry hot dogs with paper towels. Cut or rip the crescent rolls into strips. Wrap the strips around the hot dogs in a random pattern. Place on a cookie sheet. Bake until the crescent rolls have become golden brown (as per the package). For these cutie Jack O’Lanterns, you’ll need clear plastic cups, a Sharpie, macaroni and cheese, and some celery. Draw the faces on the cups before filling with the macaroni. 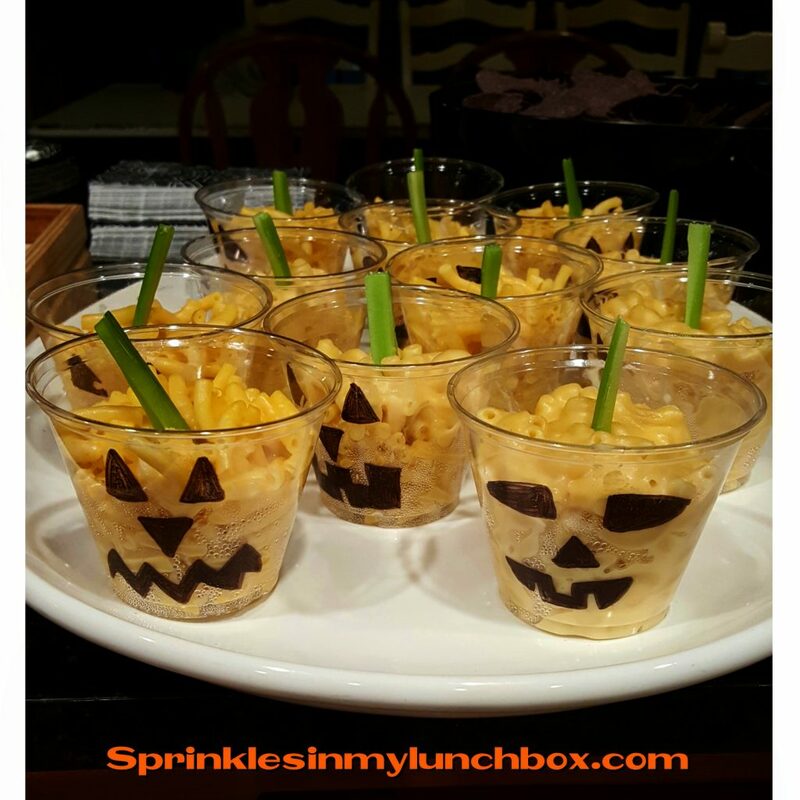 Once you have added the macaroni, place a small piece of celery in, as the pumpkin stalk. These Bat Nuggets are sure to scare! 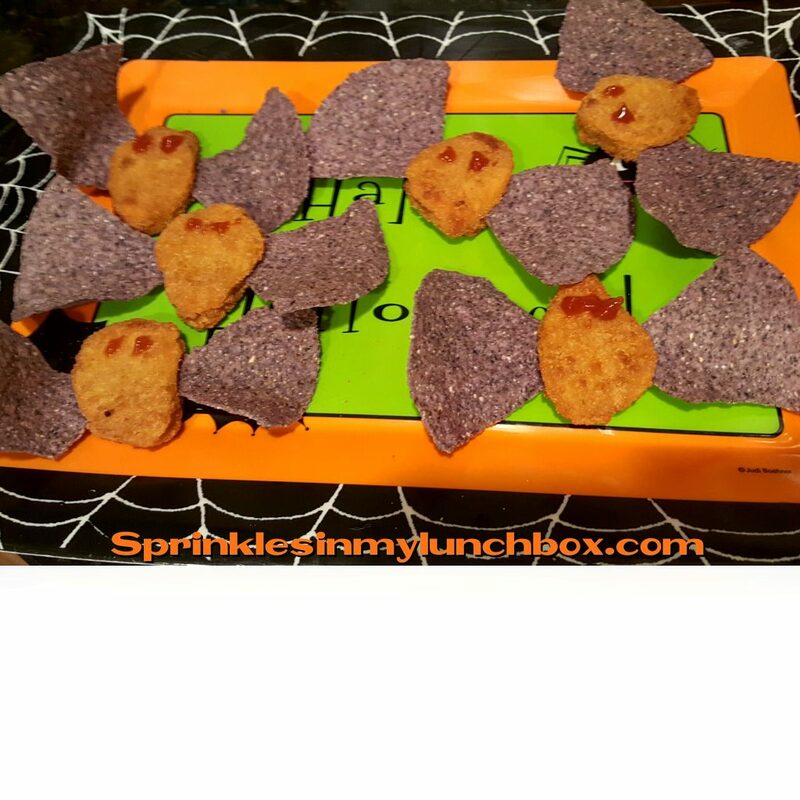 Bake your chicken nuggets, add tortilla chip wings, ketchup eyes, and make sure you eat them before they fly away! Bats fly quickly and erratically, you know. 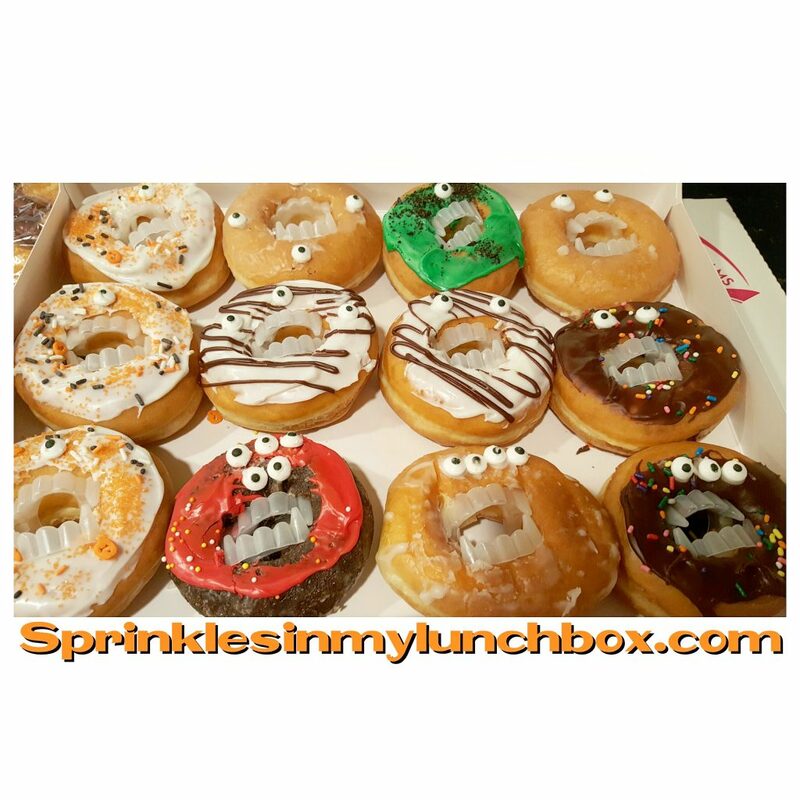 Our ghostess with the mostess put these donut monsters together, right down to the eyes and teeth! Super scary! 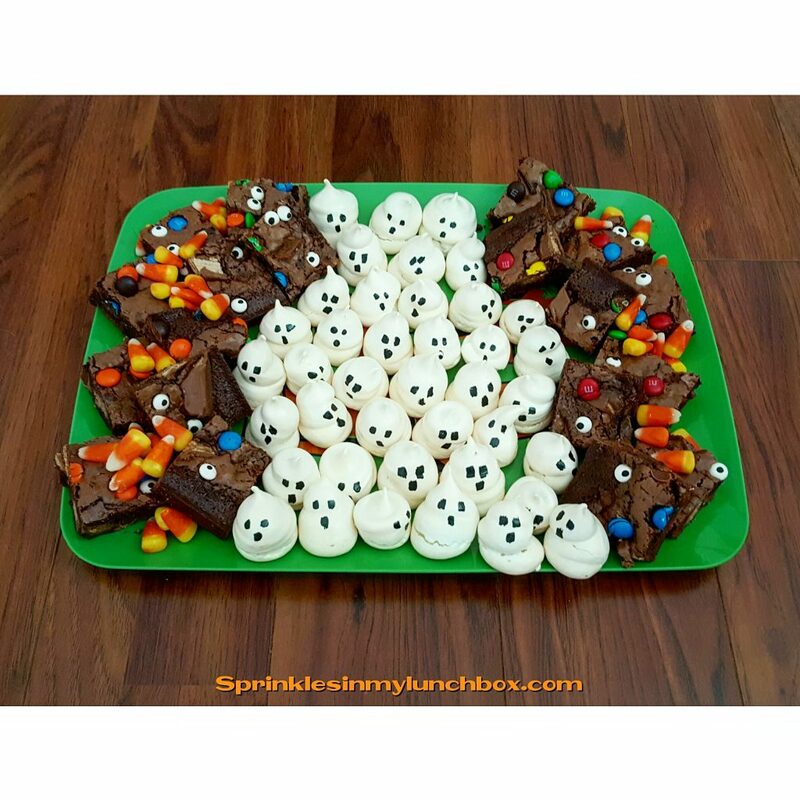 These were my contribution – Trick or Treat Brownies and Meringue “Ghosties”. 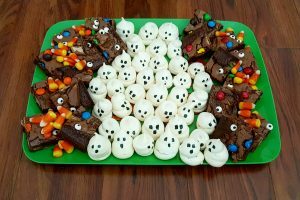 For the brownies, you’ll need one box of brownie mix, a bunch of candy (I used Kit Kats, Reese’s Peanut Butter Cups, and M&M’s), and candy eyeballs. Prepare the brownie mix and pour into a 13×9 prepared pan. Chop up the candy (not the M&M’s) and sprinkle randomly. Bake as directed. I found that my candy sank a bit as the brownies baked, so I chopped up some more and squished it into the freshly baked brownies. Do the same with more M&M’s and the eyeballs. Let cool and cut into squares. For the Meringue Ghosties, I used the following recipe. I used a food-safe paintbrush and hand painted the eyes and mouths, using black gel coloring. 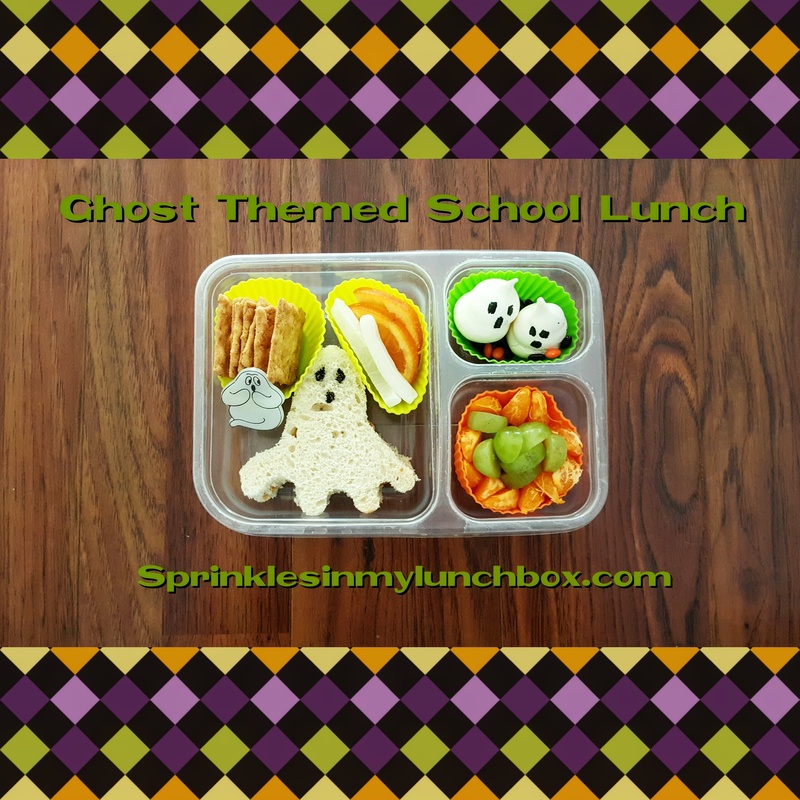 This party was so much fun, thanks to the wonderful party planning and effort put forth by our cutie gHost! 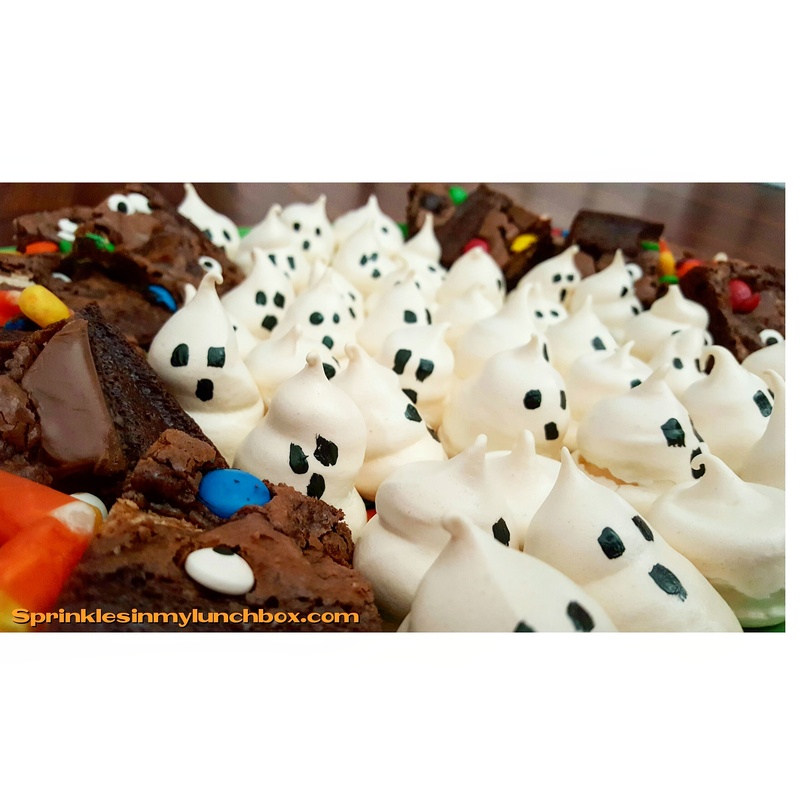 I hope your Halloween parties are as much fun and that you can use some of these ideas!